Be part of a better Grab! Recently, LTFRB opened more TNVS slots in Metro Manila, recognizing the need to have more active TNVS units to serve the increasing demand. Now, you can be part of our journey to become better by simply referring anyone who would like to be a Grab Peer to us! Just refer them through the Ka-Grab Referral Program for Passengers. As gratitude, we will be offering as much as P1,500 discount* on your Grab rides for every successful referral! How does the Ka-Grab Referral Program work? Step 1. Register the car to LTFRB. They will need the OR/CR of the car being registered. Once they complete their sign-up, they will receive an appointment date and confirmation email. Take a screenshot of the confirmation email as this will serve as proof for your reward. Make sure that your referral will register by January 3, 2019. The online registration will close after that date. Don’t forget to include your name and the mobile number registered with your Grab app as a referrer to the form so that the registration is credited to you. This is how we will verify if you’ll get the Php 500 Referral Reward. The Referral Program is open from December 22, 2018 to January 3, 2019 only. So make sure to submit referrals and the proof of appointment date during this window. We’ve provided a sample screenshot of the confirmation email below. If the referrer’s information is not submitted with the appointment date and confirmation email screenshot, you will not be able to claim the Referral Reward. Referrals submitted from December 22, 2018 to January 3, 2019 are the only ones eligible for the Referral Reward. Step 3. Get an additional Php 1,000 discount on your Grab rides if your referral gets successfully onboarded with Grab. If your referral successfully gets a Case Number during their appointment date and onboards at our Grab Driver Centers (Prima Building, QC or Wilcon IT Hub, Makati), as a referrer, you will be eligible to get the additional Referral Reward of Php 1,000. Your referral would also be able to get Php 2,000 top-up credit. Be able to get as much as Php 15,000 Referral Reward if you’re able to reach the maximum referral limit of ten (10) cars! *Referral claims are subject to Terms and Conditions. 1. Who can I refer? You can refer new cars or peers who have cars, who want to join Grab. Referrals are only valid if the car is new to the Grab Platform (or currently not existing in the Platform). If they’ve already been registered to our system before, they won’t be eligible as a referral, and won’t allow you to claim the Referral Reward. Referrals submitted from December 22, 2018 to January 3, 2019 are the only ones qualified to get the Referral Reward. Submissions prior to these dates are not eligible. The Ka-Grab Referral Program is open to all Grab App users. Please make sure to submit your name and Grab registered mobile number as part of the referrer form (New TNVS Status form). 3. What is the Referral Reward and how do I claim it? Php 500 discount on your Grab rides (via promo code): Submit the appointment date and confirmation email to Grab by January 3, 2018. Php 1,000 discount on your Grab rides (via promo code): Successfully get their Case Number from their appointment date and get onboarded with Grab from January to April 2019. 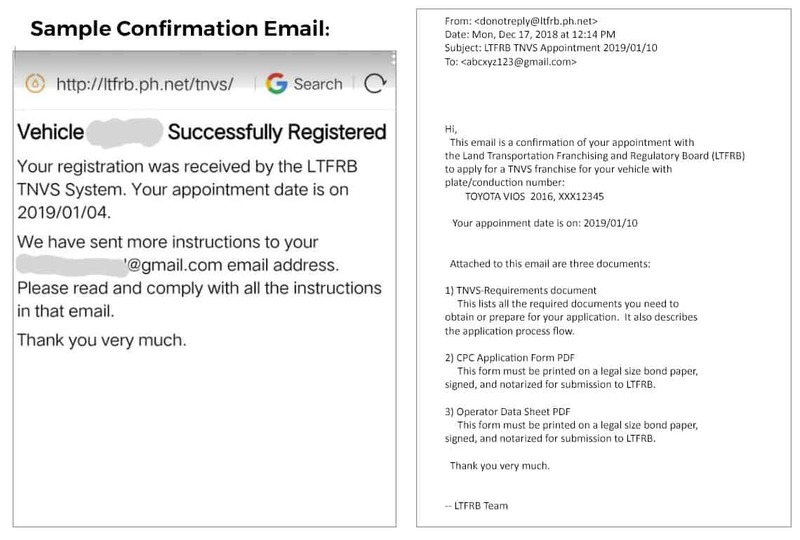 One can complete the TNVS Online Registration (Step 1) and submit the appointment date (Step 2) from December 22, 2018 to January 3, 2019 only. Your referral would need to obtain his Case Number from his appointment date with LTFRB before he/she can onboard with Grab. Don’t forget to include your referrer information (name and Grab-registered mobile number) during Step 2, so we would be able to contact and verify your referral claim. If you’re unable to include the referrer information with the submission of the appointment date, you will not be eligible to get your Referral Reward. Referrals submitted from December 22, 2018 to January 3, 2019 are the only ones qualified for the Referral Reward. 4. When will I be able to get the Referral Reward? You will be able to get the first Referral Reward of Php 500 between January 7 to 12, 2019. Grab will contact you for the next steps. For the second Referral Reward of Php 1,000. This will be awarded depending on the completion of the appointment schedule of your referral, and onboarding with Grab, which would be between January to April 2019. 5. How many can I refer to Grab? As a Grab App user, you are entitled to refer as many as ten (10) cars and be able to get as much as Php 15,000 worth of Grab rides as a Referral Reward. Eligible referrals are limited to new cars to the platform (NOT existing/registered to the platform prior to this program). 6. What does the Confirmation Email mentioned in Step 2 look like? 6. Who should fill out the TNVS Online Registration? This can be filled out by you as the referrer or by your referral. 7. Who should submit the TNVS Application Status Form? As a referrer, it would be best for you to help your referral to fill this out, since your Referral Reward is dependent on the submission of the proof of appointment date and confirmation email along with the referrer’s information. Re-submitting a form with the referrer information will invalidate your eligibility for the Referral Reward.